What a nursery rhyme! 🙂 Nice poem Tom! Ha Ha! Love the poem and the butterfly. Clever Tom, love the rhythm and the wry humour. 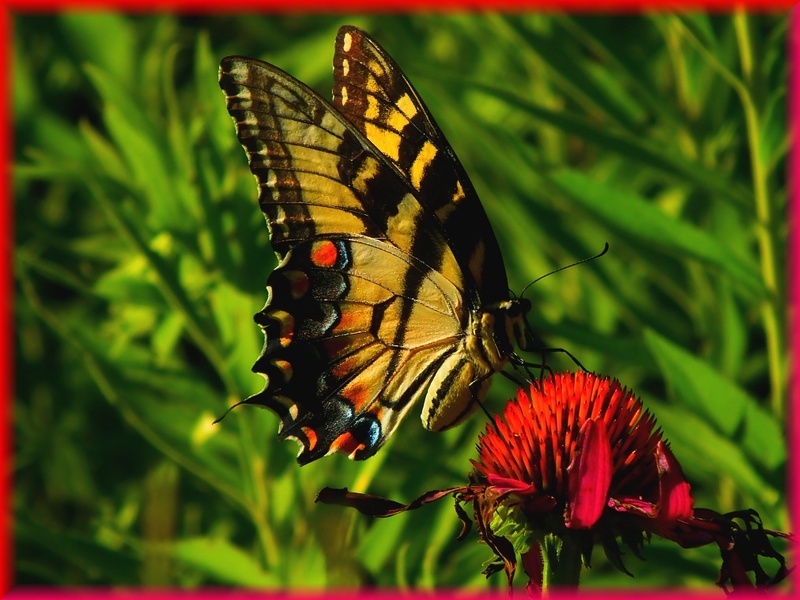 Very clever – beautiful butterfly and the butterfly’s spots and the flower are the same color! Thanks much, Linda! 🙂 I’ve got another Tiger Swallowtail photo that i’ll post in the future — that i recently had framed — that has what appears to be a “face” image in the wings! The Swallowtails are so beautiful and delicate – I’ve still only seen Cabbage Whites this year, and probably only three all Summer. We’ve not had a sunny Summer at all; it’s been hot and humid, but not so sunny (in my opinion anyway) and I think this fact has kept those beautiful butterflies away. A lot of it is man’s influence on the environment too. For instance, beautiful Monarch Butterfly caterpillars are dying in our area due to the overuse of overly potent pesticides. I’ll have a post about that in the future (with a photo that — when i took it — made me cry). I never tire of your verse and photos, Tom! Stunning photo! Enjoyed the poem, too. I do like this Tom! Great verse and photo. Lovely poem! Beautiful butterfly and I do love a good pie!